Navigation how to by Aly! 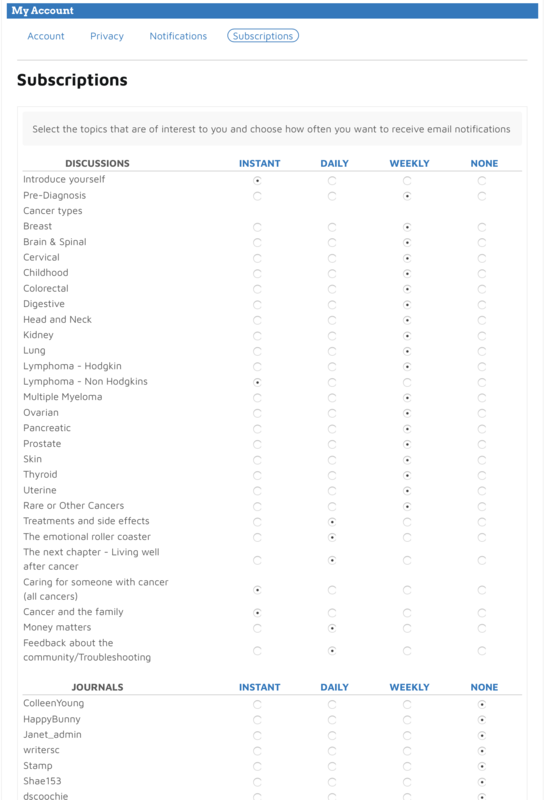 Here's a quick guide to exploring CancerConnection! 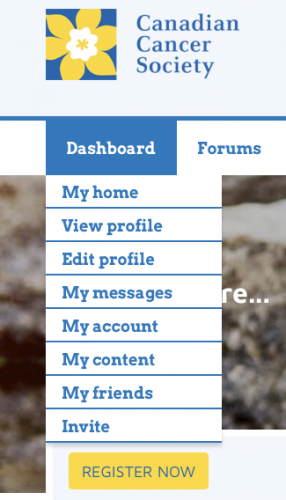 How to navigate the website using the navigation bar and dashboard tab: specifically to edit settings, view and edit your profile and content, check your inbox, manage your friends and groups and send invitations to those you think may benefit from the website. FYI: If you click on the images they will open in a bigger format. your inbox: view your private messages and notifications here! The links are similar to the navigation bar, but have a few additional options. This drop-down can be found above the header on the left-hand side of your browser. The account tab allows you to change your screen name, email, password and signature if needed. 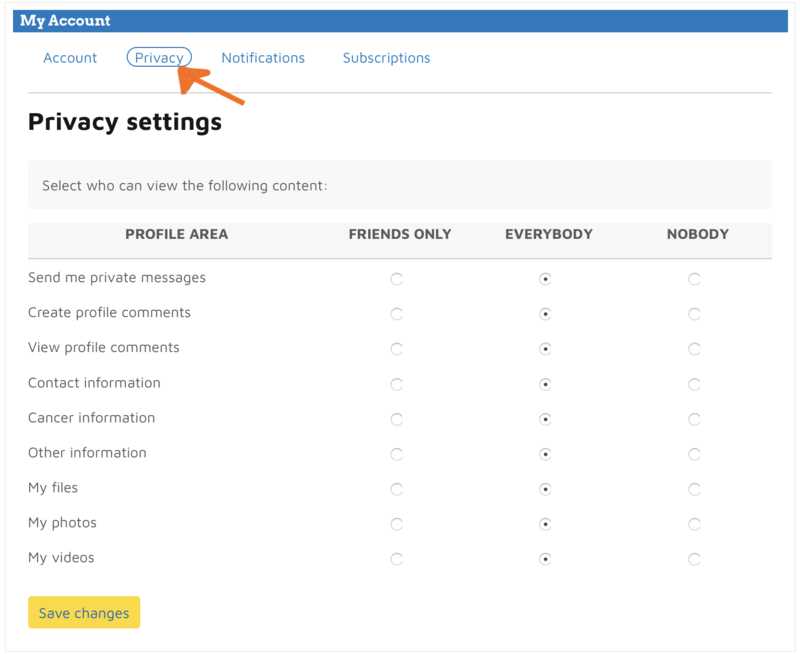 Next let's move on to edit the privacy settings by clicking on privacy (see arrow below). 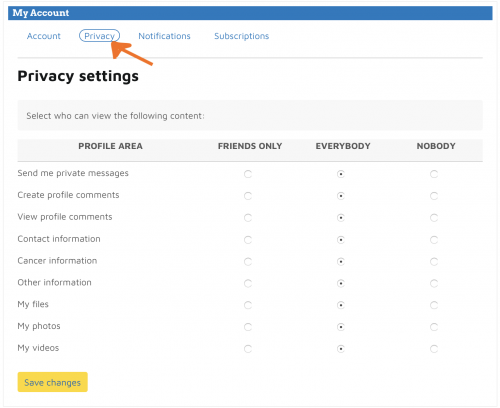 The privacy tab allows you to dictate what parts of your profile can be viewed by other members. After you've chosen your privacy settings, click the yellow 'save changes' button and then click the next link, notifications. 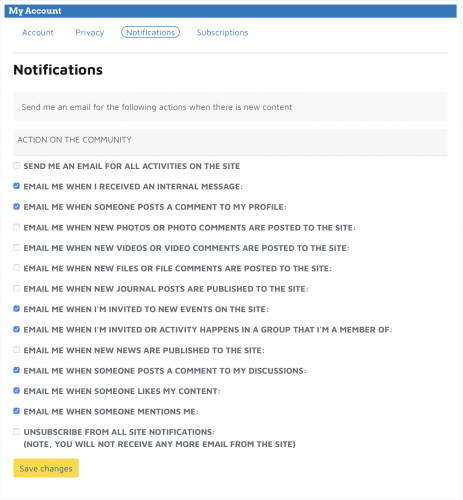 The notifications tab allows you to select what sort of emails you want to receive. After you've chosen, click the yellow 'save changes' button and then click the next link, subscriptions. 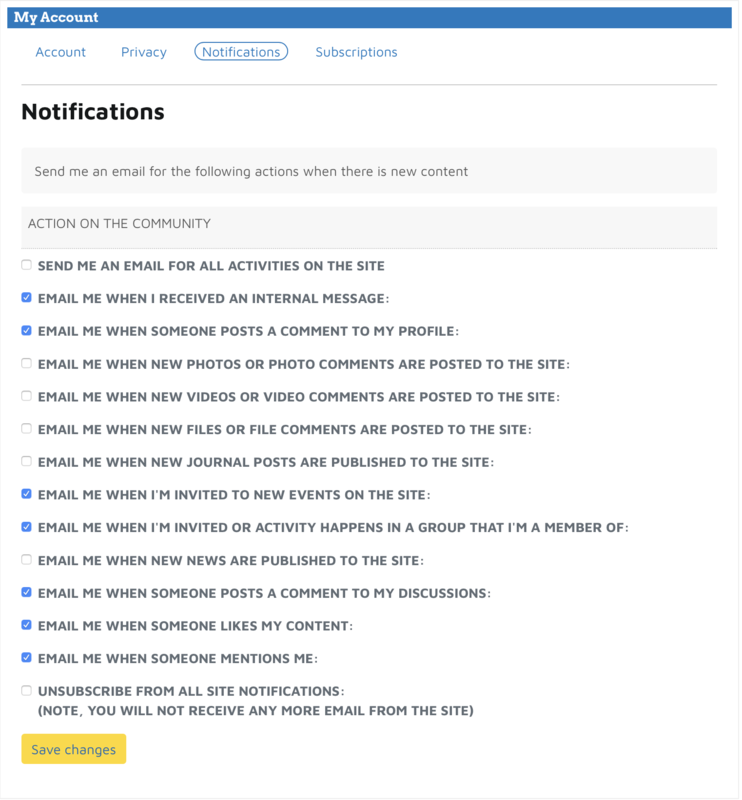 The subscription tab will allow you to choose the frequency in which you receive email notifications. At the top is discussions, followed by member journals, news, groups and finally categories. Your journal if you have created one, if not learn more here. Contact information is where you can edit information about where you reside. 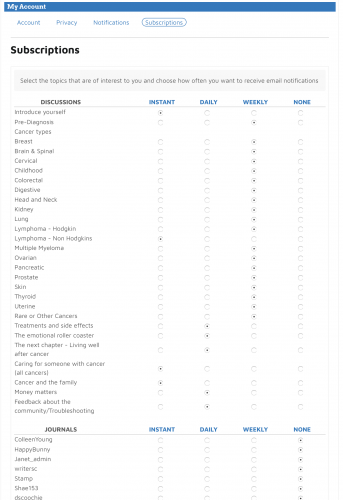 Other information is where can opt into emails from the cancer society, and other statistical information. ​​​​​​To view your content (ie. photos and videos you have uploaded) use the dashboard drop-down box and click 'my content'. Here you can view, add or edit your content. The inbox is where you will find your notifications and private messages. You can read, reply, archive and delete these messages by clicking on the message itself or using the checkbox beside each message and using the 'delete selected' or 'archive selected' buttons. To view your friends, used the dashboard drop-down menu and click 'my friends'. This page will allow you to view your friends, send a message or remove someone from your friends list. ​​​Once you've found someone you want to add, click on their profile. On their page there will be a 'user actions' area just like when you viewed your own profile. The last action is the add as a friend function, click this link and it will send a friend request to the person. Young Adults is for those between the ages of 18 and 35. Click the yellow 'join group' button to become a member! Think someone else can benefit from CancerConnection? Invite them by using the dashboard drop-down box and clicking 'invite'. Add the person's email and edit the message (there is a standard one automatically entered) and click 'send invitation'!